Here are some of my favorite skincare products that I recommend starting off the new year, keeping your skin clean, moisturized and ready for the winter season! 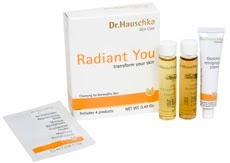 1) Dr.Hauschka Radiant You ($11.95) comes in a trial size kit, including a cleansing cream, lavender bath, clarifying toner and rejuvenating mask, perfect for your next trip. Available for normal/dry or oily/combination skin. Visit drhauschka.com/pressandroll to learn about Dr.Hauschka's signature "Press and Roll" cleansing technique. 2) Dr.Hauschka Aromatherapy Bath Kit ($19.95) features five pure essential oils - lemon, lavender, rosemary, spruce and sage to energize, relax or soothe. Add a few drops to a basin for a face wash or in bath water. Perfect for travel. 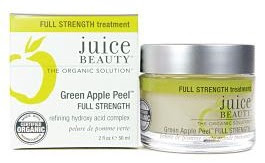 3) Juice Beauty Green Apple Peel Full Strength ($45) is a potent alpha and beta hydroxy acid complex from organic apple, lemon, grape raw cane sugar and willow bark. 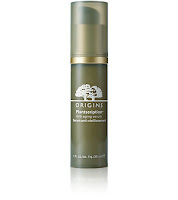 Reveals a brighter complexion while firming the skin and eliminating the appearance of fine lines and wrinkles. Exfoliate once a week by applying to face and neck. 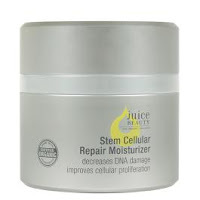 4) Juice Beauty Stem Cellular Repair Moisturizer ($65) has a proprietary blend of fruit stem cells that deeply penetrates the skin to repair DNA damage and encourages new cell growth to aggressively firm and eliminate wrinkles. Antioxidant-rich fruit juices, fat-soluble Vitamin C and plant oils hydrate and improve elasticity for lasting, advanced age defy results. 5) Origins Plantscription™ ($55) anti-aging serum with Anogeissu reduces wrinkle length and depth, smooths uneven skin texture, visibly lifts sagging contours and revives youthful "bounce" and firmness in just 4 weeks, without irritation. Skin is clinically firmer, smoother and more lifted-looking. To be applied morning and night. 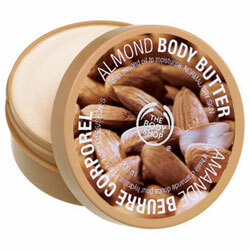 6) The Body Shop Body Butter will leave skin soft and super smooth. It is available for four different skin types: normal, normal to dry, dry to very dry and all skin types. The Body Shop Almond Body Butter ($18) for normal to dry skin is my favorite, with the Mango Body Butter, for dry to very dry skin easily my second favorite scent.